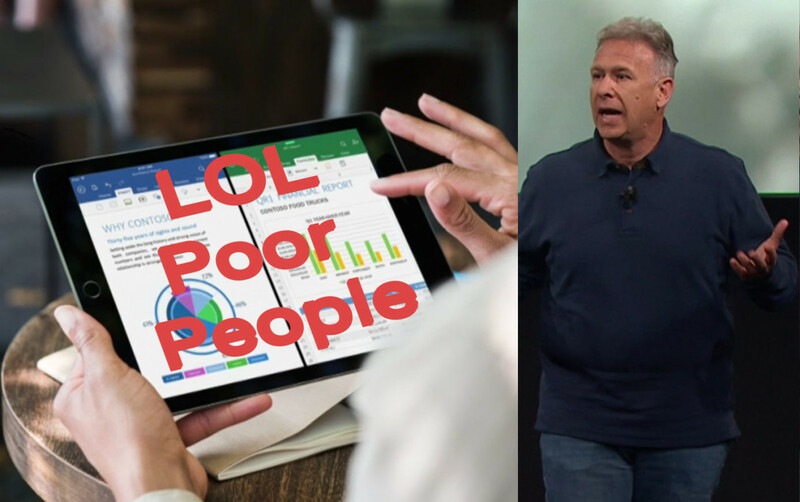 Apple events often bring about their fair share of controversy – sometimes the lack of diversity, sometimes with unwanted free music – but today the company hit a new low: making fun of poor people. While presenting the new 9.7-inch iPad Pro today, Phil Schiller, Apple’s vice president of worldwide marketing, said that most of the people who buy an iPad Pro are coming from a Windows PC. Few people would actively choose to use an older PC if presented with a newer one for free, but computers – especially Apple ones – cost a lot of money. There is nothing wrong about keeping an old computer working, unless Apple thinks not wanting to or being able to spend hundreds or thousands of dollars on a new computer is something to be ashamed of. And mind you, Apple is insulting the same people it’s trying to get to upgrade to a new iPad Pro, as if the tablet form factor will somehow entice the hordes of people with old devices to suddenly want to buy a new one. It’s not as if there weren’t already plenty of even more affordable devices to choose from running Windows, Android or Chrome OS. Insensitivity aside, the comment was also jarringly hypocritical. Earlier in the keynote, Lisa Jackson, Apple’s vice president of environment, policy and social initiatives, claimed part of what made Apple so environmentally friendly was that “most” of its devices were reused – that Apple products were built to last. See the irony? Apple admits that hundreds of millions of people can still get their day-to-day work done on PCs a half decade old, but it seems old devices are only worth keeping if they have an Apple logo. Not to mention the company announces new products every half a year. Why claim products are built to last, but make people feel like their gadgets are inadequate six months later? I want to give Schiller the benefit of the doubt; his job is marketing, and the statistic was possibly aimed at stockholders who could might see an opening for Apple to sell iPad Pros to users of old PCs. Apple certainly didn’t mean to directly make fun of those with low-income or in a situation where buying a new computer isn’t sensible. But for a company that has already has a reputation for designing products aimed at a higher income bracket – Apple products are expensive, because they don’t compromise on the design – hearing comments like Schiller’s makes me worry whether Apple is actively turning a blind eye to poor people too.